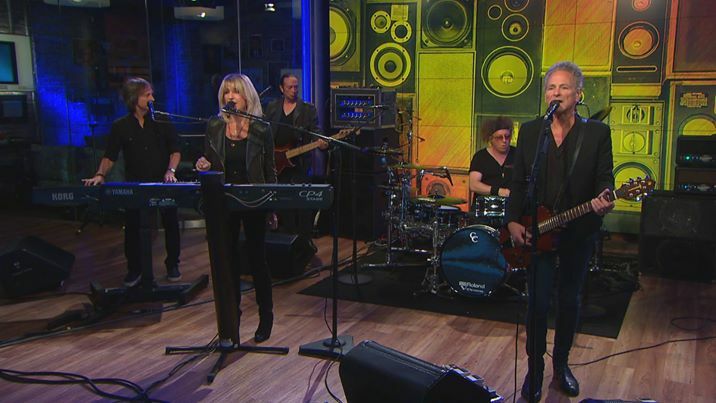 Fleetwood Mac members Lindsey Buckingham and Christine McVie performed a pair of tunes from their newly-released self-titled debut album on CBS This Morning on June 10 and video from the program is available online. The duo delivered the project’s second single, “Feel About You”, and “Love Is Here To Stay” from the set and sat down with host Anthony Mason to discuss the record, which originated from a series of studio sessions in 2014 after McVie reunited with the band for dates on their On With The Show tour. Buckingham and McVie recorded eight tunes with the drummer Mick Fleetwood and bassist John McVie before resuming the group’s world tour, and when word spread they were in the studio – even without Stevie Nicks – fans wondered if the project started out as the foundation for a new album by the veteran band. "No, it didn't really,” Buckingham explains. “There was no idea of saying, 'Oh we're trying to make a Fleetwood Mac album.' It was just, 'Let's get together and have some fun with this.' But as I said, it only took about a week for us to start to get a little territorial about it maybe being a duet album." Currently making the rounds doing media interviews and performances, Buckingham McVie will debut the new material during a series of summer dates across North America, starting June 21 in Atlanta, GA. The pair will also regroup with Fleetwood Mac in July to co-headline The Classic East and West festivals in New York and Los Angeles alongside The Eagles.